From the Thirteenth Century, craftsmen became more creative with the way they decorated their wares. 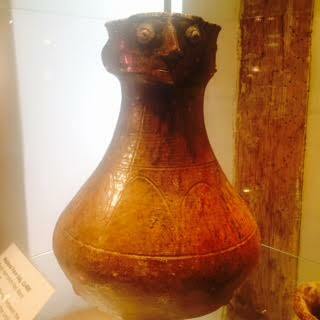 At King John’s House we have an example of this in the form of a medieval face jug. The jugs were intended to be both aesthetically interesting as well as fully-functional. As the Middle Ages progressed, face jugs became more and more popular. Some historians have argued that the face jugs found in England, both the decoration as well as the shape of the jug itself, were possibly influenced by trade and travel with countries situated around the Mediterranean basin – in particular, through inter-cultural contact in places such as Iberia, Northern Africa, Sicily and the Crusader States. The jug we have in our collection bears remarkable resemblance, though is less detailed, to a similar item housed at the British Museum. The Item at the British Museum has been dated to between 1270 and 1310, so it is likely that our face jug was also made during this period. Designs on medieval jugs varied from region to region, and jugs made in the Kingston area – a major manufacturing site for pottery during this time – favoured faces. Historians do not definitively know what sort of person a jug like this would have belonged to. There is little evidence to suggest that anthropomorphic face jugs were linked with wealthier owners. However, because it is likely that the jug in our collection was made in Kingston – a fair distance to travel in the medieval period, and because in general there are fewer examples of anthropomorphic jugs than other designs, it is likely that this particular jug did belong to a wealthier member of the Romsey community.